AUDUSD is chiefly under the influence of North Korea’s plan about launching missiles over Japan. 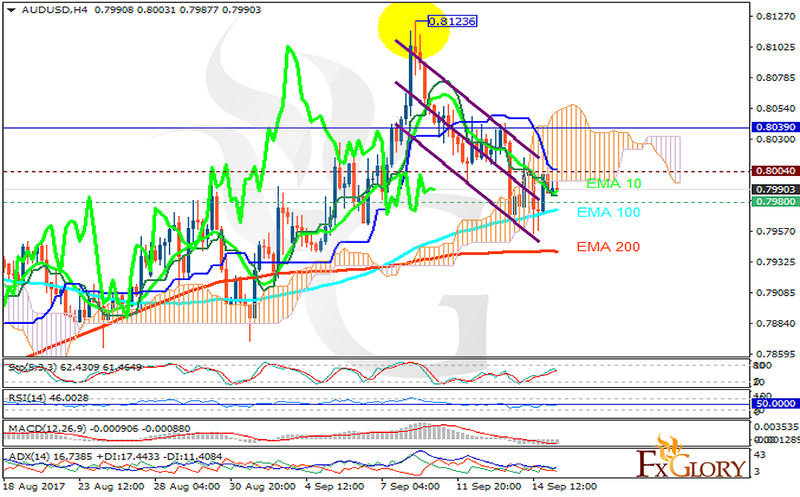 The support rests at 0.79800 with resistance at 0.80040 which both lines are below the weekly pivot point at 0.80390. The EMA of 10 is moving with bearish bias within the descendant channel but it is above the EMA of 200 and the EMA of 100. The RSI is moving on the 50 level, the MACD indicator is in negative territory and the Stochastic is showing upward momentum. The ADX is not showing any clear signals. The price is in the Ichimoku Cloud and above the Chinkou Span. The Tenkan-sen is showing a downward trend while the Kijun-sen is showing a horizontal trend. Long positions are recommended targeting 0.805.